Tuesday 18th April saw the launch of Valley Leisure’s ‘Choga’ class at a new community venue in Andover, the Gilliat Hall on Marlborough Street. ‘Choga’ or chair yoga is a predominantly seated exercise class, suitable for anyone wishing to experience the benefits of yoga, without the strong, standing poses. Set up in partnership with the Older People’s Mental Health Team at Andover War Memorial Hospital, ‘Choga’ is ideal for older people looking to work the body and relax the mind to feel both rested and rejuvenated. 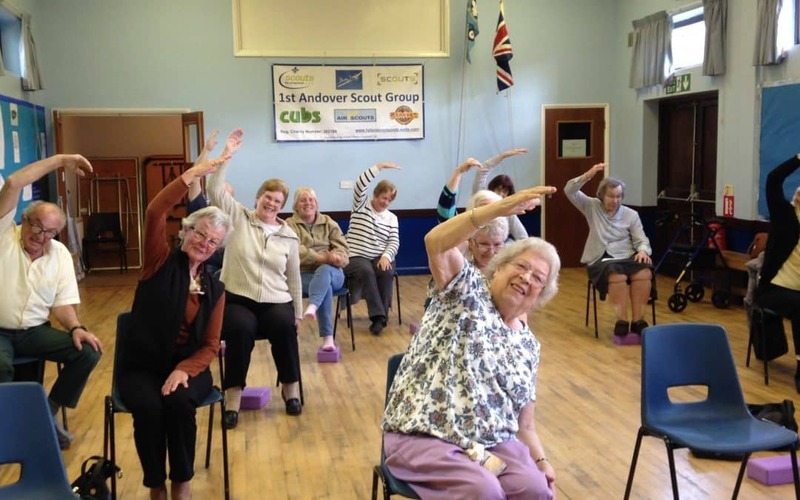 The class features gentle stretches, twists and strength building exercises and is particularly suitable for those whose movements are limited by illness, injury or disuse who are looking to improve mobility and flexibility. Alison Moran from the Older People’s Mental Health Team supports some of the participants who access the class and said “The gentle exercise helps improve people’s mood and physical health, and the relaxation is beneficial for helping people manage their anxiety and stress. Attending the Choga class is greatly beneficial in improving and maintaining people’s wellbeing. The class is a relaxed environment where people feel safe and supported”. Helen Portas, founder of LIM yoga, teaches the weekly class and specialises in delivering restorative yoga classes for health and wellbeing benefits. Helen modifies the exercises and offers safe alternatives to enable even those with underlying health issues to participate up to a level they feel comfortable with. Choga takes place every Tuesday afternoon from 2.00-3.00pm (changing to 11am-12pm from Tuesday 6th June) at the Gilliat Hall, 28 Marlborough Street, Andover and costs £4 per person per session. For more information and to book a place, please contact Valley Leisure on 01264 568240 or email Liz Murray, Community Health Development Manager on lmurray@valleyleisure.com.